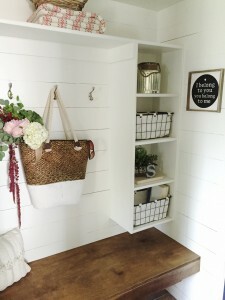 My husband and I have been wanting to add a mudroom to our back entry for a couple years and we are so happy to finally have it looking the way we want it! 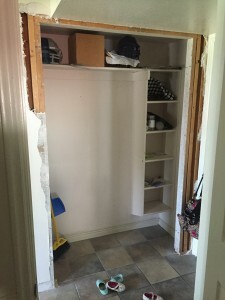 This space previously had bifold closet doors. These doors drove my husband crazy because a certain someone (me) was not very good about closing them. If the closet doors were open the back door was blocked making it impossible to come in. We needed shoe shelves, open and simple. I was not interested in cupboard doors because I need quick and easy access to grab and put away shoes. It may not ‘hide’ all the shoes, but it does mean that they will at least get put away. Any attempt at hiding our shoes behind some kind of door would result in piles of shoes blocking the hallway. My own shoes included in the mix. Dang. Open shelving for us yespleasethankyou! We also wanted hooks, at least one per family member so that each person will have their own space (we bought a few extra hooks in hopes that a few more littles will join our family one day). My recent obsession with the TV show Fixer Upper has convinced me I need shiplap in my life, so I added that to the list a few months ago. Can I just say – this was SO much fun to put up! I will have a tutorial on my blog coming soon. I also wanted a dark back door. This door leads to our garage and gets all sorts of scuff marks, dirty finger prints, and dirt. I am hoping the darker color will help the door look cleaner, longer. We needed baskets for our cubbies. These were already built in from the closet before. I need a space for all the random items that float around my house, but really belong by the garage. I know I can’t be the only one who always has a pile of ‘things to return’. Friends accidentally leave something at our house, we borrow an item, I purchased something that didn’t work out… I need a whole basket for this category. I also wanted a basket for ‘outings’. In the winter this will mainly consist of knit gloves and hats. In the summer I like to have a pair of Sunglasses for me (and if I have one, the kiddos all want one too – so make that 3 sunglasses), sunscreen, a few snacks, extra socks (so random but needed over here), and a water bottle, to grab and go on a walk or to run errands. Stay tuned for tutorials on this space. Hop onto Instagram or Facebook to be notified on my latest posts and projects! I hope to see you soon! Thank you for you comment! 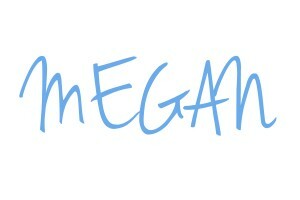 I will make it my next post:) Look for it within the week! 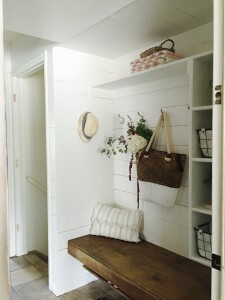 Looking forward to the bench tutorial…I’ve been wanting to do something just like this with our front closet! I’m currently remodeling a second home and would love to incorporate some of you’re lovely ideas. 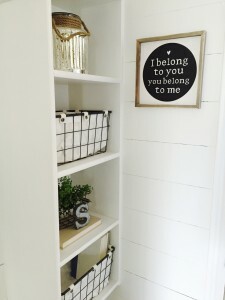 #1 I’m curious what creamy color paint you use on your shiplap? #2 I love, love, love, your tile too? Any hints there? Where you got it, what’s it called? Hi Regina! I hope my reply isn’t too late! We’ve had a baby and have been renovating a new house so I have taken a long break from my blog but am picking it back up with the new year. The paint color is Benjamin Moore Simply White. Although I often mix Benjamin Moore colors in Valspar paint instead, Lowes (or any other paint store) should be able to look up the color and mix it in your preferred brand of paint. The floor was already there, but when I removed the old closet framework we had to add a few tiles and were able to find a near match at Home Depot. I am not sure what the tile was called as we only bought 4 squares. I hope this helps! 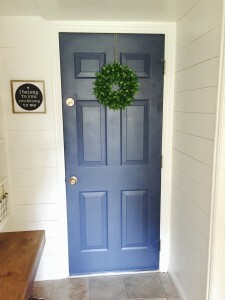 PLEASE tell me the paint color for your door in the mudroom!!! 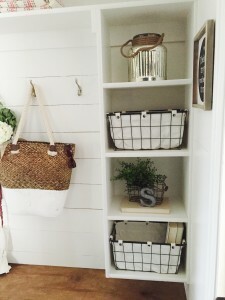 I must copy it as I’ve just remodeled my mudroom to look so similar to this! Thank you! Hi Jenny, I used a can of spray paint to do this door. I no longer have the can :(. So sorry that wasn’t helpful. And sorry it has taken me so long to respond. 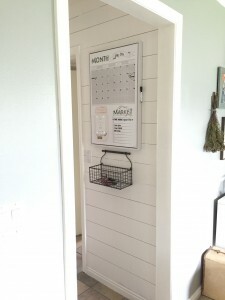 I would love to see your mudroom if you take a pic. 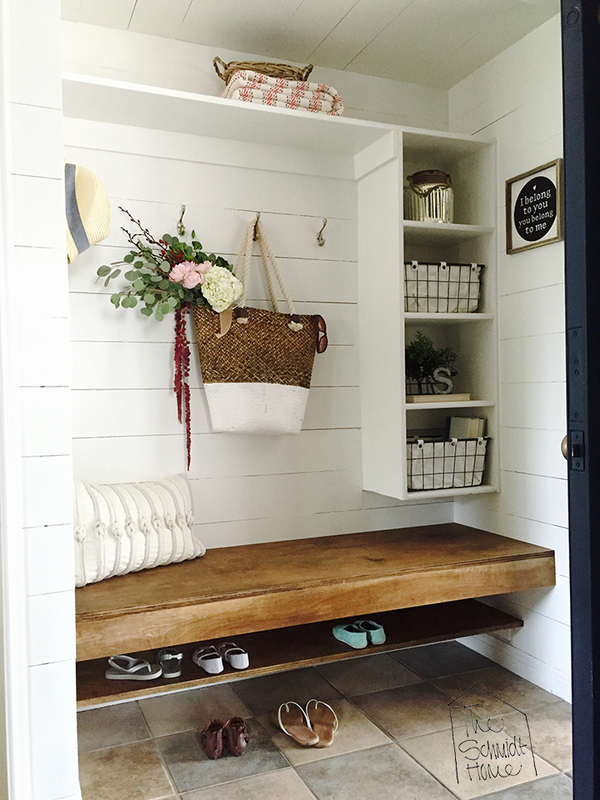 Tag me on instagram @theschmidthome, I love to see everyone’s own spin on this mudroom.